Each morning we drove separate trucks as Ron had to leave for work. Friday morning I hit the button to unlock all the doors so I could get my vest & gun from the back seat. I had left my keys in the cup holder as usual. I shut the driver’s door & tried to open the back door. It was then that I realized that I had hit the button the wrong way & did something I have never done before…….LOCKED MY KEYS IN MY TRUCK!!!!. “SON OF A B----!!! !” “What’s wrong” says Ron. “ I locked my freaking (or a word to that effect) keys in the truck!!! !”, says I. Luckily, I always travel with a spare set of keys. Luckily, again, The Roost was close so we headed back, got my keys, & still got set-up before the 1st gobble. Ron got a pretty good laugh about that, keep saying, “I’m laughing with you, not at you.”. I’m not so sure about that. Today it was pretty much do or die. We got all the saplings trimmed down & settled in. Ron got things started early with the "Team Lucky Dawgs" traveling calls, eliciting a few gobbles from a bird behind us in the woods. He had to leave at 6:30 as he had some work to do before a couple of internments. At 8 straight up, I looked to my right & saw the backs of at least 2 birds walking down the drive lane at the top of the oat field. All I could see where the tops of the backs & had no idea what they were. I sent out a few yelps & purrs & saw a big, red periscope pop up. I figure he knew where the “girls” were, & shut-up. About 20 minutes later, I looked right again & here came a hen. She was pecking here & there taking her time to get down to the 2 hens & jake dekes we had set out. She was only about 10 feet from me but never got any closed than 20 yards of the decoys. After purring & clucking for a few minutes, she headed back the way she came & disappeared into the woods. At about 8:45, I started to make a few soft yelps when I looked & noticed a big bird in the upper corner of the field. Again, I stopped calling & started watching. It moved a little close & I could see it was a tom. He fed & piddled close to where I had last seen the hen & I was afraid he would follow her but he kept on coming. Every once in awhile, he would go into strut, so I knew he had seen the dekes. There were some small limbs hanging between us &, when his back was towards me, I though I could move around & get a good shot on him when he cleared the branches. Suddenly, I heard this little, tiny voice in the far recesses of my mind (I hear a lot of little, tiny voice, but that’s a whole nuther story). That little voice said: “YOU SIT RIGHT THERE & BE STILL, YOUNG MAN!! AND DON’T YOU DARE MOVE!!! !” “Yes Ma’am.” So that’s exactly what I did. The Oat Field Gobbler finally started towards the dekes. I was ready & just waiting for the right moment to drop the hammer. The last time he went into a full strut, I could hear the pop. I was thinking: “Man, it’s a shame that I have to shoot you.” I got as far as “Man. It’s a shame I have to” when he dropped strut, BOOM, “shoot you”. It took over 30 minutes from 1st sighting to when I officially joined the Gobbler’s Roost 1 Shot Turkey Kill Club with full honors as he still had all his tail feathers. DON’TCHA JUST LOVE IT WHEN A PLAN COMES TOGETHER!! It was 9:21, 2 hours & 39 minutes before my season was to end when the 11-87 sent a lethal load of Magic Pixie Dust (Fed Heavyweight #7s) into a wise old gobblers head. Maybe some day the skeptics will accept that the HW 7s are deadly. Nah, that ain’t a gonna happen. Ron & Momma got to The Roost around 4. Momma planted a few flowers while Ron & I took pics, lotsa pics. Ron had a Friends of the NRA banquet that night so I was just gonna kick back at camp for the evening. Someone called with a ticket they couldn’t use, so I tagged along. Another 1st was this banquet & auction. Ron was good enough to swap me his steak for my chicken. It was a great steak. Thx Ron. It was a fun evening & the perfect way to end a great week. Whenever I’m hunting with some one on their home turf, I always defer about 90% of the time to them. I figure they know a heckuva lot more about the birds then I do. That’s how it worked this time as well. Several times, I would make a suggestion & Ron replied that he had been thinking the same thing. The reverse also happened several times. This was a total team hunt & success. Thanks Ron for a great week & an even greater turkey. He’s my best Eastern to date & my 2nd best turkey of any species. It’s always a great to spend time with a good friend & Ron is a gooder un. Thanks again Ron. This is what attracted the Oat Field Gobbler along with some sweet talk from a slate made by Cap’t Mel. More on that later. Cap’t Mel (Gotcha1) made a call for me from native Florida wood. I don’t remember the woods, so Cap’t, if you see this, please tell me again. It’s slate over crystal. It was the call I which helped got the gobbler fired up Weds. I used the slate side to bring him to the gun. Thanks Cap’t Mel for a great call. The Oat Field Gobbler had the thickest beard of any bird I have ever killed. That’s a silver dollar covering the end of the beard. The "Team Lucky Dawgs" traveling calls which Ron used to get things started. With this years Call Host hat. Thanks for the opportunity to host again & I’m glad all y’all were so successful with my call. It's TIME to hear the "Rest Of The Story"! It is always a Good Time when George arrives at camp. Not only is he a Good Cook ... He is fun to setup to hunt and this year I got a Few Moments in the blind with him before I had to Go BURYIN'! First of all ... The night before Season I received a phone call from the Breeder of Jinger Lou that she had been Whelped that day so I was excited about the prospects of Training a Turkey Dog that Summer! First day plan was to set George up on the edge of a Long Meadow where the Turkeys are seen in the early to mid-morning! NOW -- George was Traveling with the MOST GOD AWFUL FULL-STRUT Gobbler decoy that I have ever seen. this along with a hen was what he was going to use! WHATEVER! BTW -- I don't use decoys! So we were all set up and the Temp was about 47! Gobbling Started and the Bird was above us coming to the meadow! At about 100 yards he comes out! HUGE! He starts toward us and is FULLY COMMITTED! Breast SPONGE is just Flopping as he hurries toward DEATH! I look over at George and his Breathing is Rapid and he is Shaking! SWEET!!!! George gets over this and is READY! SUDDENLY the Gobbler sees something that he DOES NOT LIKE and EXITS STAGE LEFT! WHEW!!!!!!!!!!! We set around for another hour or so and then I have to sneak out and get to work! On my way out I see the Big Boy in a Small Meadow below us and hope George gets another chance! Next day plan ... Move the Blind closer to where the Bird enters the Field and set up RIGHT NEXT TO THE STONE WALL! Also, MOVE THE STRUTTER DECOY to a little more inconspicuous spot! We hear the Gobbler from the roost and say to each other , "We are in the RIGHT SPOT"! 15 - 20 minutes later We receive a RUDE REMOVAL OF OUR HAT! The Gobbler had been able to arrive without us seeing him by walking up to the stone wall behind the Blind! I bet he was 6 FOOT FROM US when he GOBBLED! HOLY CRAP! Well - He walks to an opening in the stone wall and sees that DAMN STRUTTER DECOY and OFF HE GOES! GEORGE -- You gots to adjust your set up! After a while I sneak out again for work! AND -- You guessed it -- I see the Old boy again in the Small meadow below us! That night I tell George that the set up for the day would be between the Long and Short Meadows and the decoys WOULD BE CHANGED! A small hen with a Jake in Breeding mode was the choice and the REST IS HISTORY! Gretchen was a Great Dog! Jinger Lou is Becoming one! The dekes I had were Pretty Boy & Girl. Now Ron, You have to admit that the dekes did look pretty good BUT, they were HUGE!!!! I think that is what the problem was. It scared off any gobs that were coming in. 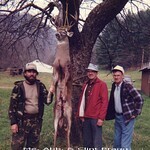 I used them a couple of times in WV before this hunt. When I got home, they went into the closet & have stayed there. I now use Avian X dekes. The jakes are 3/4 size & work great. We used Ron's foam dekes stuffed with newspapers & the Oat Field Gobbler liked them. This was an additional story I posted about the Oat Field Gobbler. Well, I finally got finished “mounting” last springs NY gobbler that Ron & I got my last day there. Well, if I hadn’t gotten him, it would have been my next to last day. I told Ron that, if I hadn’t killed him Friday, I would hunt him Saturday as it was personal. This bird toyed with me for 4 days before Ron & I devised a plan that worked. Ron had given me a large knothole from a tree he had cut down. I wanted to mount the pic behind it with the hooks, beard & tail. The opening wasn’t large enough to show the pic so I had to quarter the knot hole & use it for the corners of the plaque I used. I think it turned out pretty well.